Without fresh water, both cut and potted trees will gradually dry out and become brittle, dropping their needles and drooping their branches. A well-watered tree is much more fragrant with that fresh piney scent, and will hold its needles longer. The needles will be more pliable, and the tree will stay full for longer. A well-watered tree is also less of a fire risk, making watering the tree a critical part of Christmas safety. Size: Larger, fuller trees naturally need more water to reach the tips of every branch, while smaller trees can be watered less frequently. Species: Different tree species have different watering needs and thirst levels. The longer a tree's needles, the more water it will generally need. Freshness: A fresher tree may be thirsty at first, but needs less water to retain its beauty than a tree that has already begun to dry out. Climate: Where the tree is kept will impact its watering needs. If the house is warmer with less humidity, the tree will need more water. Location: Trees that are kept near vents or drafts will dry out more quickly and will need greater quantities of water to stay fresh. The tree stand should be able to hold plenty of water – at least a gallon or more. Avoid shallow, small stands that will empty more quickly. Be sure the stand is level and firmly situated so it will not tip, spill or leak. Before putting the tree into the stand, cut one-half inch or more off the trunk with a straight, level cut. This exposes vessels so the tree can take up water more easily. After the cut is made, the tree should be put in water as quickly as possible. Do not carve away at the sides of the trunk believing that will help water uptake. The most vigorous vessels carrying water to the tree are closest to the trunk, and if they are carved away, the tree will remain thirsty. If the tree is too big to fit in the stand without whittling, buy a larger stand rather than forcing the trunk to fit. Old wives' tales advocate adding lemon juice, sugar or other ingredients to the tree's water, but they won't help it stay fresh longer or take up more water. Plain, fresh, clean water is best, and plenty of it. Curious pets will naturally investigate a Christmas tree, and both cats and dogs may take a drink from a tree stand. This takes water away from the tree and isn't healthy for the pets, so be sure they keep away from the tree's water. Trees can drink a lot of water, and their drinking needs can change from day to day. Check the water level in the tree's stand at least twice a day – in the morning and evening – or more frequently if possible, topping it off whenever needed. Help the tree stay fresh and firm by cooling the room off, and it will not lose as much moisture to evaporation or respiration. Close furnace vents near the Christmas tree, and lower the room's temperature for a few degrees at night. 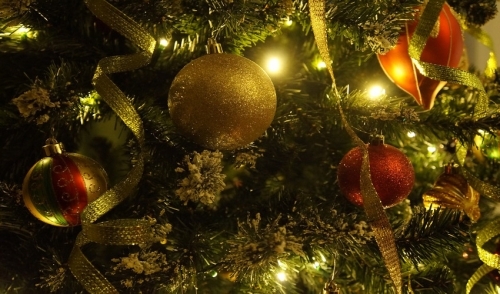 LED lights or other low-heat lights are the best choice to keep a Christmas tree moisturized, since warmer lights will heat up the tree and cause water to evaporate more quickly from its needles. Fewer lights or turning the lights on less frequently or for shorter periods can also help. It's easy to take steps to be sure your Christmas tree is getting enough water, and once you understand the tree's moisture needs, you can enjoy a lush, full, fresh tree all season long.